Do you miss a lot of school or work due to painful, heavy periods? Are you in pain and practically bedridden a few days every month? Does your cycle dictate what you can do each month according to your menstrual calendar? Did your gynecologist tell you this is normal and prescribe birth control pills? Today it’s common for young girls and women to have irregular, painful menstrual periods and be miserable a few days each month. In fact, women feel like it is expected. That is what is supposed to happen, the way it’s supposed to be. It feels like it is the norm, but believe it or not, it is actually not normal. A normal menstrual cycle lasts 28 days. The first day a woman starts her period is day one of her menstrual cycle. During the first 14 days of the menstrual cycle, the ovaries make increasing amounts of estrogen. This 2 week period during which estrogen hormones are highest is termed the proliferative stage. Midway through a woman’s cycle, around day 14, one of her two ovaries will produce an egg. This is called ovulation. After ovulation, the ruptured follicle from which the egg has been released is transformed to a corpus luteum and begins producing progesterone as well as a small amount of testosterone. Both progesterone and testosterone, which peak just after ovulation, stimulate a woman’s desire for sexual relations. The portion of the menstrual cycle that follows ovulation, called the secretory phase, is orchestrated by progesterone. Progesterone’s importance to pregnancy is suggested by its name, which literally means “promoting gestation.” If the egg fails to be fertilized and no pregnancy occurs, the production of both progesterone and the estrogen hormones dramatically falls at the end of the 28 day menstrual cycle. The endometrial lining is shed, leading to a period. This cycle repeats itself over and over again during a woman’s menstrual life, which extends from the time her periods begin at puberty until her periods cease at menopause. The female menstrual cycle is a complex system, so when one or more hormones are deficient or out of balance, you start getting uncomfortable, painful symptoms. While there are many causes of irregular periods, the one we see and treat the most is caused by a hormone imbalance, in particular, a progesterone deficiency and low thyroid function. Many doctors do not realize that optimal thyroid function is necessary for a healthy menstrual cycle. Women with hypothyroidism are at a greater risk for PMS and often experience more intense symptoms. Severe painful periods is more common in hypothyroid women, as well. According to Dr. Broda Barnes, thyroid deficiency has been associated with menstrual irregularities even before thyroid therapy became available. About one hundred years ago, when thyroidectomies (removal of the thyroid gland) first came into use, menstrual irregularities developed in many women after this procedure was done. As soon as thyroid supplementation therapy became available in 1891, there were reports of successful use of it for resolving menstrual problems. Some of those results were as follows: Women who had stopped menstrual periods prematurely resumed them; those with excessive flow had relief; and many were relieved of their painful cramps. 2) the need for recognition that hypothyroidism may be present despite lab tests suggesting it’s not. A physician must be able to correlate the clinical appearance of the patient with the lab findings. Dr. Barnes adds that the basal temperature test can be a guide, often more valuable than any laboratory test, to recognize and diagnose hypothyroidism. Today so many young girls are put on birth control pills in their early teens to combat the symptoms of PMS and irregular periods, but this does not solve the underlying problem and can only cause them more harm in the future. Birth control pills contain the synthetic hormones estrogen and progestin (not progesterone), and some contain only progestin. They are created to stop your body from ovulating and prevent the egg from being released from the ovary, which negatively affects hormone balance. Normally, when an egg is released from your ovary at ovulation, progesterone is also released. 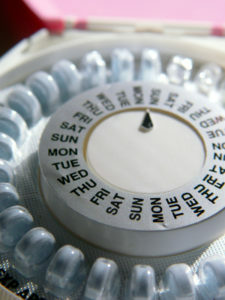 Since birth control pills stop you from ovulating, they prevent this release of progesterone. This is where the problem lies. It’s important to note that by taking birth control pills, you are taking risks with your health and doing more than just affecting your period. Some of the common side effects include an increased risk of breast cancer and cervical cancer, blood clots, high blood pressure, weight gain, bloating, decreased libido, migraines, mood changes, breast tenderness, increased arterial plaque and increased risk of heart attack and stroke. If you are taking birth control pills to relieve symptoms of PMS or to regulate your periods, there is a better, safer way. Often the reason you are having symptoms is due to an imbalance of progesterone and estrogen, when you are low in progesterone. This is why it is so important to mimic the function of the menstrual hormones as precisely as possible with bioidentical hormones to restore proper balance. At Hotze Health & Wellness Center, we believe that the key to a healthy menstrual cycle is optimal hormone balance. Evaluation of menstrual problems requires a multi-step evaluation. Our doctors take a complete medical history, focusing particularly on your personal and family reproductive history, your menstrual cycle, as well as thyroid and hormonal history. We use bioidentical progesterone and natural desiccated thyroid to correct progesterone deficiency and low thyroid function to bring your body back into balance. Take our symptom checker quiz to find out if hormonal imbalance is the cause of your irregular cycles.